Hi, everyone. Is anyone else stressed because your kiddos don’t have Halloween costumes yet? I know I am! Fortunately, my kids have switched from wanting to be Minions (Despicable Me), to wanting to be witches. As much fun as I think it would be to make Minion costumes, I am so grateful that they switched to something easier! Dare I even say it? I might even buy the costumes instead of make them. I know. It hurts, but sometimes there just isn’t enough time for everything. I’m trying really hard get over the idea that I have to make everything myself. I just love to create things so much that it’s hard sometimes to step back and just buy it. Plus, I love to save money! Speaking of making things myself and saving money . 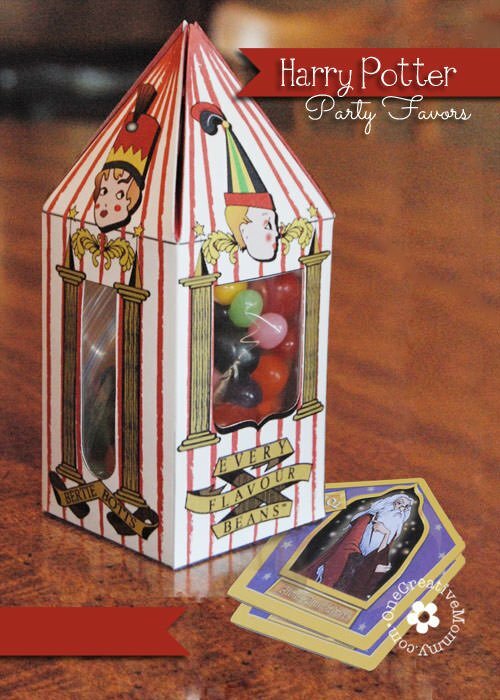 . . I’m so excited to share these DIY Harry Potter party favors! These were created back at a time when I had a little more time on my hands than I do now! Good news for you, though. I’ve already figured out what works and where to find the printable links, so you don’t have to. These were my favorite project from the party. You can buy these online, but they are pricey and not nearly as cute. If you want to skip this project and just buy them, you can find them here at Amazon.) I am a total cheapskate, so let me tell you how I saved some money on these babies. First, cut out the boxes and window holes. (Use a scoring tool or blade to make the folding easier.) Next, cut rectangles of clear cellophane (or use any stiff plastic you can find to recycle) to fit behind the window holes. Use double-sided tape to secure in place. Finally, assemble the boxes and secure the edges with double-sided tape (leaving the top open). It would take a ton of jelly beans to fill these boxes. You don’t want to spend that much money, and the parents don’t want their kids to eat that much candy! Fill a snack-size ziplock bag with any combination of jelly beans. I used a mixture of regular jelly beans and generic jelly bellies. 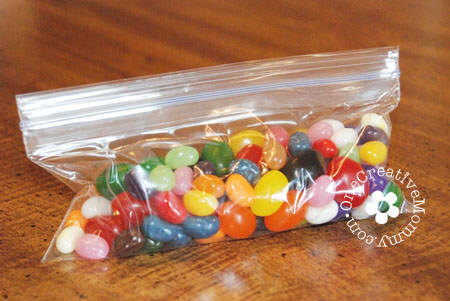 Slide the bag of jelly beans sideways into the box, and adjust it so that the ziplock is hidden from the windows. To close the boxes, I put one glue dot in each top red section and pinched the top closed. Download the *free printable from Chica and Jo here. (I changed the color slightly. Your download will look more royal blue than purple.) *These printables might not be free anymore. I just checked the link, and it looks like it links you to an Etsy store. 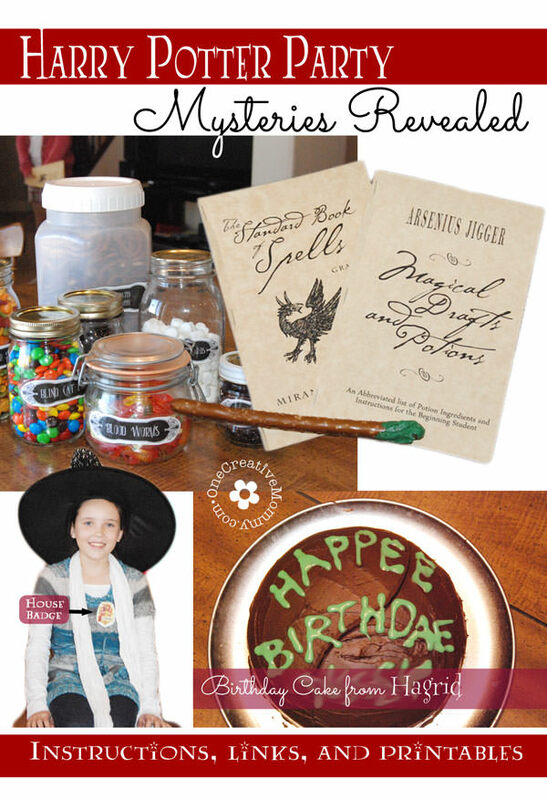 The good news is that the printable package also includes some other Harry Potter candy printables. You definitely need a scoring blade for this project! 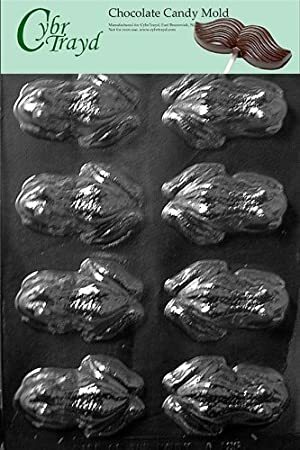 My chocolate frogs were made in this candy mold (from Amazon). I included the link at the end of this post. I bought it online just before the party, and it was perfect! It’s probably easiest to use candy melts, but I used melted Hershey bars mixed with semi-sweet chocolate chips. The chocolate was soooo tasty! Just melt the chocolate in a double boiler (or slowly in the microwave–stirring after every 30 seconds), pour it into the molds, and put it in the refrigerator to harden. Since I had cards inside the boxes, I put the frogs inside a plastic bag before putting them in the boxes. 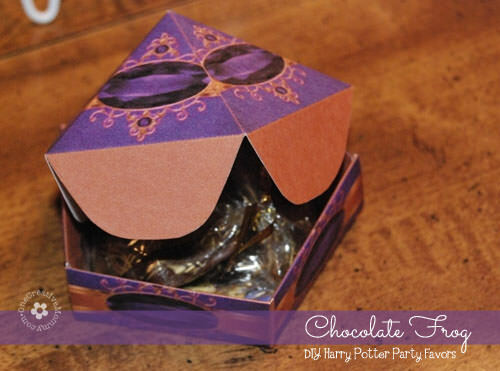 If you want your chocolate frogs to be really authentic, of course you need to include a trading card in each box! I created six different cards, so that the kids wouldn’t all get the same. I’m sure you’d be fine with only one (or none)! That’s it. 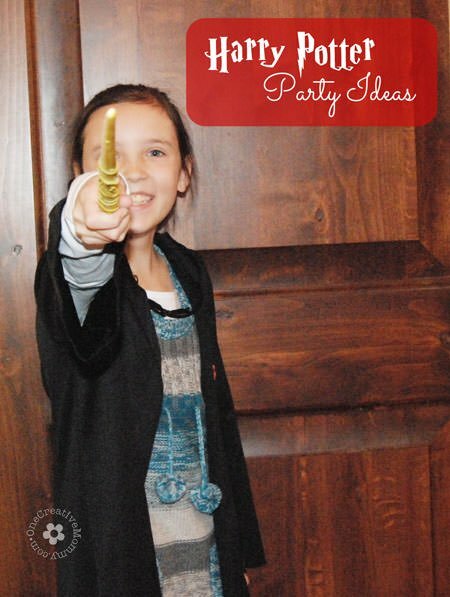 I’m finally done with all of my Harry Potter Party posts! (It’s only taken two years to finally get them posted! I hope I didn’t bore my non-Harry-Potter-loving fans too much! If you missed any of the posts, I’ll link them all here. Love love love. I think every flavour beans will be appearing in Christmas stockings in about 2 months time. Oh my goodness! These are so awesome! 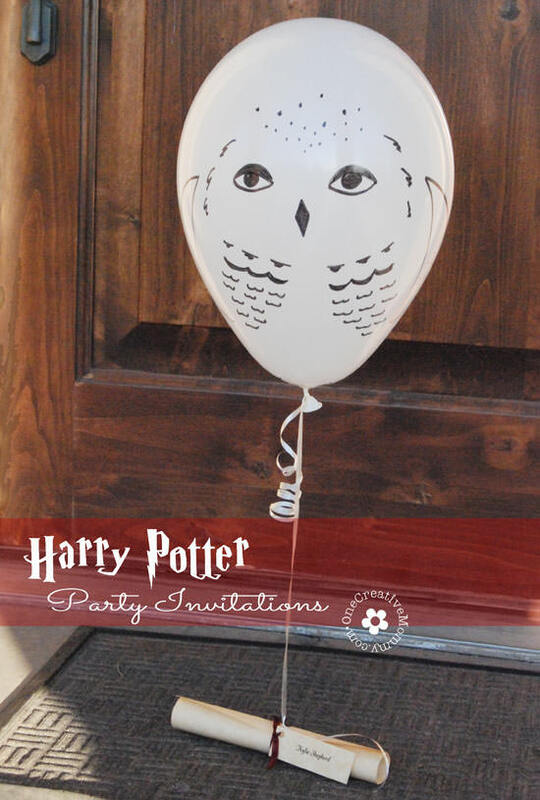 <3 I may have to celebrate my half birthday just to have a Harry Potter Party now. Sounds like a great idea to me, Dani! Thanks for stopping by. This is fantastic! Thank you so much! I love Harry Potter! Thanks, Chelsea! I hope you get to try the ideas sometime. Very cool! I would have been so in love with that 10 years ago! WOW! this is great!! Unfortunately I’m too late to get those chocolate frog cards. I was wondering if you will be able to send me your copy via email please? 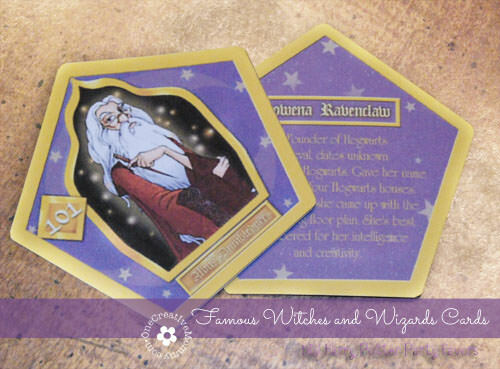 I’m planning to have a Harry Potter theme party soon and those cards would be excellent! If you can’t, I understand =). I’m so sorry, Shin. I wish I could, but the images are copywrited. Good luck with your party! So if you could link to this page and name me as the designer I would be really great full. I hope to hear from you, because I think it’s only fair to credit the one that made it. I did try to contact the designer, but I never heard back. I’m sending you a private message, Babet. Thanks. Hi! I absolutely love your ideas and would like to make the boxes for my upcoming party. Can you let me know how/where you printed the templates? Thank you! Hi, Mancala. There is a link to the original design in the post. I altered it slightly to make mine, but the original design is great, and should work well for you. 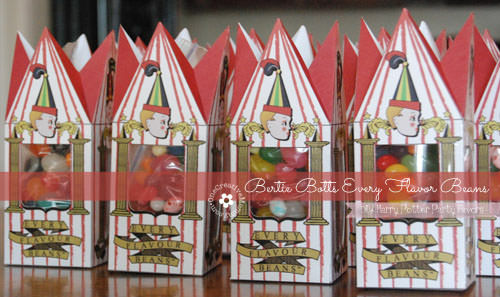 The link is in the section titled Bertie Botts Every Flavor Beans. Second paragraph. Good luck with your party! Sorry! Mangala. My autocorrect changed the spelling of your name, and I didn’t notice!